At their most basic, abrasive blasting cabinets are essentially the same things as sandpaper. Cabinets use compressed air instead of belt to deliver the abrasive to a surface! Sandpaper uses the same abrasive as a blasting cabinet but rather than leaving it loose, it’s bonded to the carrier surface. Keeping the basic fundamentals in mind, remember that all sanding is based on the hardness of the abrasive material. Recycling abrasive – by reusing the sandpaper, sanding belt, or loose granules – is based on the materials resistance to wear. Using harder abrasive media or special materials inside any abrasive blasting cabinet helps prevent the machine from failing. Because sand is soft, it actually causes the blast cabinet to fail more often than not. Using soft slag, sand, garnet or other abrasives that fall low on the Mohs Scale of mineral hardness is detrimental to sandblast cabinets. These soft abrasives should be used in blast rooms where recycling abrasive is not the priority. As these soft abrasives make contact with the part you are blasting, they break apart on impact and become dust. In sandblast cabinets, the particles of dust quickly overwhelm the dust collector. This is what we mean by failure the operator has no visibility, production is slowed or halted all together, and often the cleanliness around the machine decreases. Using a harder abrasive, like steel shot, results in minimal dust created from the material being removed from the item being blasted. The steel shot doesn’t break down upon impact, and the peening process actually improves the strength of many parts blasted. Can you use sand in a media blasting cabinet? Certainly! But you must have expensive equipment manufactured to pre-separate the used, “spent sand” and keep it from entering the dust collector. This equipment also includes “HEPA After Filters” increasing the efficiency of the dust collector when using sand. Using sand is also a health hazard and known to create the medical condition known as silicosis. It should raise red flag warnings if someone tells you to use sand in a blast cabinet without also warning you of the required OSHA safety precautions. Despite these concerns, we see many people using homemade or DIY blast cabinets and inappropriate abrasive materials. This is particularly true of soda blasting machines. Rather than use sand, why not simply use a harder abrasive? Aluminum oxide, for example, offers no health hazard and recycles over and over improving your ROI. 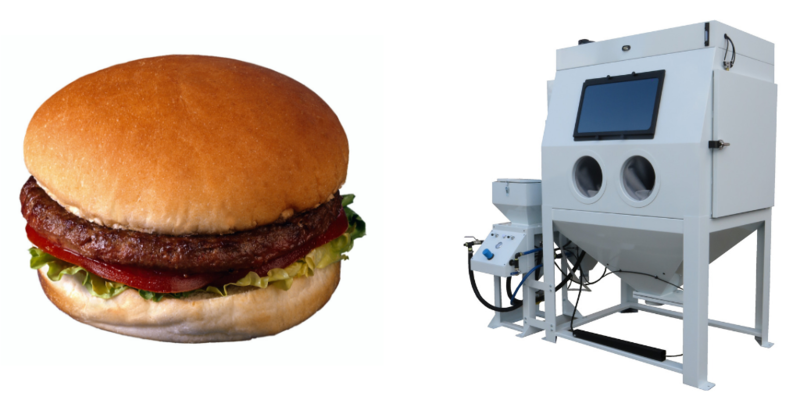 So What Do Hamburgers and Sandblast Cabinets Have In Common? One of the first printed tags on our early machines featured a small, circular tag about 2-1/2 inches in diameter that read: “You don’t find ham in a hamburger and you don’t use sand in a Sand Blaster!” If you have a machine that features one of these tags, give us a shout out on Twitter or Facebook and include a photo of the tag. Media Blast & Abrasive has been manufacturing sandblast cabinets since the 1970s. Our brand name is so respected; it’s become a trade name, like Kleenex or Xerox. We make more than 180 standard models and sizes of abrasive blast cabinets. In addition to a comprehensive list of included features, we offer more than 80 optional features for increased productivity, durability, and operator safety.